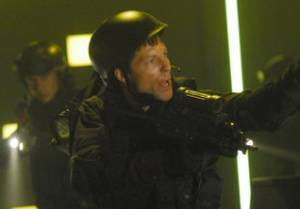 10/21/06: Galactica finds the abandoned basestar. Boarding parties are sent and capture a few survivors. The survivors reveal the source of the virus and that Hera is still alive. It is also learned that not only is Baltar with the Cylons, but he's now attempting to lead the Cylons to Earth. 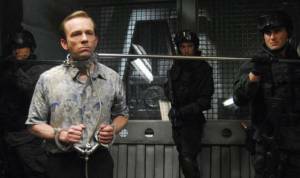 [In an interview, Tricia Helfer said that Baltar's Six would ask Caprica Three to torture Baltar. Lee is back in action as part of one of the boarding parties to the disabled basestar. Kara's got herself a Leoben from the dying basestar. Galactica has itself a Five (Doral) under heavy security. 9/27/06: Preliminary Episode Synopsis: The plague is studied and considered as a bio-weapon against the Cylons.